A study published in 2012 in the Journals of Gerontology looked at vitamin D levels in 6,257 elderly women and found that those with levels below 10 nanograms per milliliter (ng/mL) had more cognitive dysfunction than women with vitamin D levels of 30 ng/mL and above. Researchers at the University of Manchester measured vitamin D levels in 3,133 middle-aged and older men in Europe and found that those with higher levels did better on tests for attention and speed of information processing. 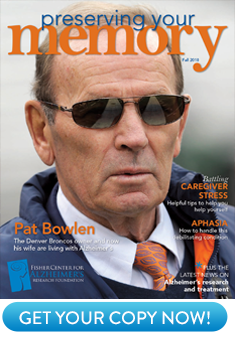 A 2009 analysis using data from the Third National Health and Nutrition Survey (NHANES) showed that vitamin D deficiency is associated with an increased risk for cognitive impairment. Vitamin D is a fat-soluble vitamin best known for its role in bone health because it aids in the absorption of calcium. 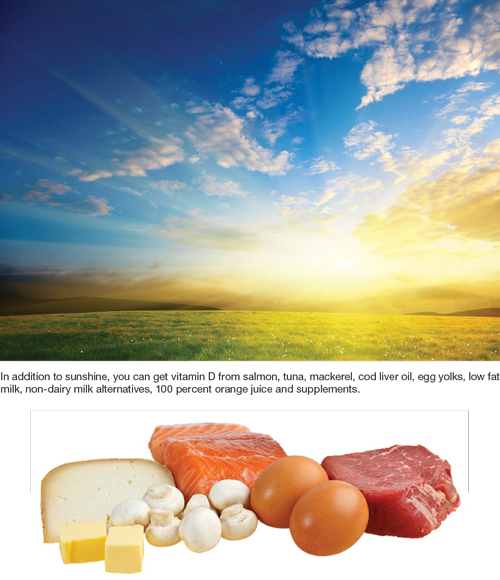 Vitamin D also plays a critical role in cell growth, immune function, and the formation and development of the brain. Still, experts agree that more research is needed before declaring a direct link between vitamin D and cognitive function. In the meantime, it’s important to get enough vitamin D in your diet. The amount you need varies by age and depends on whom you ask. “Scientists and other public health organizations are debating the amount that should be recommended based on recent studies indicating the benefits of vitamin D,” Dubost says. The National Osteoporosis Foundation, for instance, recommends 400 International Units (IU, equivalent to 0.01 mg) to 800 IU (0.02 mg) of vitamin D daily for adults under age 50, and 800 IU to 1000 IU (0.25 mg) for older adults. An important source of vitamin D is sunshine. The body makes vitamin D when the skin is exposed to the sun. Dubost recommends sensible sun exposure, which she describes as five to ten minutes two or three days a week. This will vary depending on the season and where you live (latitude). Getting vitamin D from food isn’t easy since few foods contain it naturally. Some exceptions include oily fish— salmon, tuna and mackerel—cod liver oil and egg yolks. (See recipe on the next page.) Fortified foods like low fat milk, non-dairy milk alternatives, and 100 percent orange juice are healthy options, too. You can also get vitamin D from supplements (also called vitamin D3). way of spicing food. If you can’t find fresh tuna, use any firm fish, such as halibut or salmon. 1. Rinse the fish and pat it dry with paper towels. Place it in a glass pie plate and drizzle with olive oil and lemon juice. Let the fish marinate in the refrigerator for at least 15 minutes and up to 4 hours. 2. P reheat grill. Place the tuna on a double-thick sheet of aluminum foil that has been sprayed with the cooking spray; place it on the grill. Grill the fish, turning it once, until it flakes and is not quite opaque in the center. This takes between 4 and 8 minutes per side, depending on the thickness of the fish. 3. Preheat oven to 400ºF. Combine the remaining 2 teaspoons of olive oil, the chopped onion, and the garlic in a glass, oven-safe pie plate. Bake for 7 to 8 minutes, stirring halfway through. Mix the salt into the tomatoes; stir the tomatoes into the onion mixture and continue to roast for 4 to 5 minutes, until the tomatoes are warmed and the onion is starting to brown. Remove from the oven, stir in the chopped parsley and capers, if using. 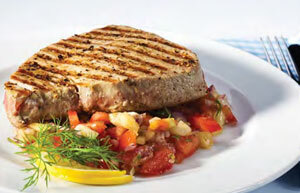 Spoon the mixture evenly over the grilled tuna steaks. Add the desired amount of black pepper.